KEY FEATURES: A tree to 9m. 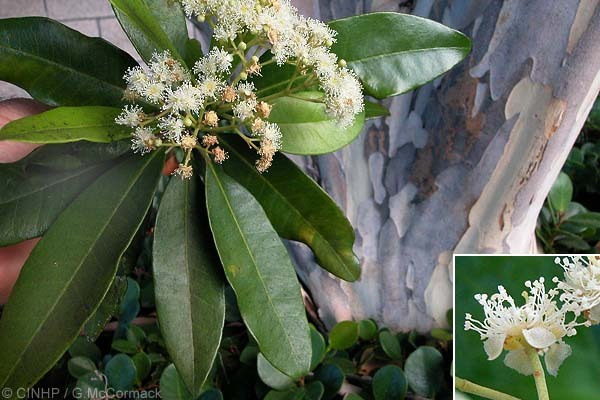 LEAVES opposite, fragrant when bruised; oval to narrow-oval, to15x6cm; stalk 10-15mm. FLOWERS clusters, ~terminal clusters; white, to 1cmØ; 4 petals and 4 sepal lobes. FRUIT to 7mmØ, ripening dark purple. POSITIVE SIGNIFICANCE: (Cond 2+). Comments: The commercially available Allspice is made from the dried unripe fruits. It has the flavour of a mixture of Cinnamon, Nutmeg and Cloves. GENERAL NOTE: Ripe fruits are used in Jamaica (- the largest producer of Allpspice) to make 'Pimento Dram' a Rum based drink. A leaf-oil is used to make Bay Rum undrinkable (ie to adulterate it). Atiu: Motel, 11/2000, no flowers, putative ID GM.